I am very distractible. Students know this; I know this. For this and multiple other reasons (including insipid tardiness on the part of my students) the first few minutes of class is often filled with retrieving forgotten textbooks, quieting down the pockets of flirtation, and acknowledging the students who show up two minutes late with a coffee. Numerous factors have led me to the institution of class starters for grade 9s. I will do my best to summarize them here and introduce my framework, theory, and pedagogy behind them. I used starters to establish a culture of curiosity and conjecturing with my set of “gifted” grade 9 students last year. The tone was beautiful. It taught me valuable lessons about how I need to approach and ameliorate the process into the class time, as well as important logistical tweaks that need to be made. A teacher at my school uses quick start-up questions to encourage punctuality. His are graded, and essentially consist of textbook problems from the previous day. While his motives for using the system are different, the hope of greater efficiency does appeal to me. My interest in classrooms as complex systems (see Davis & Simmt, 2003 for a good summary) is growing as my studies continue. I believe that teachers need to base their practice in theory–a deep personalization of theory. This doesn’t mean a citation justifies my actions, but my daily enactment of the theory with my students does. It takes a being open to reflection and reflexivity. I have found that providing students with a stage to enter into a topic best facilitates the climate of complexity. This means my starter questions are often roundabout ways at deriving the curricular content. They roughly align with the chapters in the textbook, but provide multiple avenues for interpretation and pockets of organization. In this way, starters are not meant to assess the students on whether they did their homework, but provide the spark for organized chaos. Some repeat to provide a chance for deeper analysis, and others lend themselves nicely to a “one-and-done” philosophy. It is important for me to root my classroom practice in theory; it enables me to make justifiable decisions on the fly. Class begins with a question projected on the board. 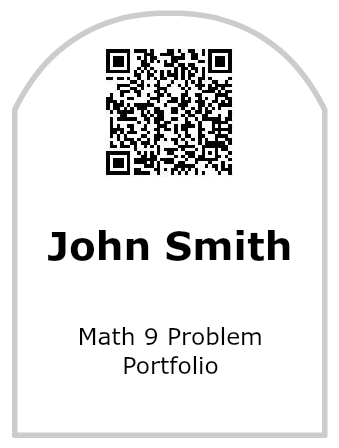 Students get into the routine of having their starter portfolio out when the class starts. (I will explain this detail later). As I take attendance, students work on their own problem, but are encouraged to compare with others after they have prepared an argument for their own. This way, the class slowly gets noisier as the multiple strategies are discussed. I generally sit and allow students’ ideas to make the rounds. I do not circulate (like I normally do during an open task). I want them to own the work. It doesn’t take long before students share, “That’s what I did” as the question is being explained. After the student volunteers are exhausted, I usually do one of two things: 1) I highlight a particular student that never shared but I happened to overhear some genius thinking or 2) I ask a leading question about an interpretation that was missed or a connection to something previously encountered. In this way, the starters do not only serve as an efficiency piece, but a crucial way to start the process of community networking and establish the organizations of complexity. Just a side note: If you are wondering where to begin to amass these types of problems, visual patterns.org and estimation180.com are great places to start. From there, be imaginative. Find connections to your units of study, anticipate student responses, or scour your existing sources for problems. What do students use to answer the problems? Last year I had them bring in a three-ringed folder to put sheets into. This offered a couple problems. 1) those folders become disorganized quickly. 2) full-size sheets were daunting for many students. 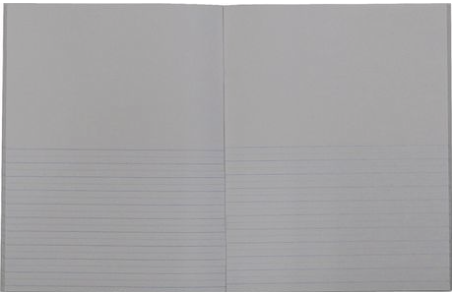 This year I decided to have them purchase a small exercise book with 1/2 blank and 1/2 ruled pages. In Canada, they are made by Hilroy; I do not know where you Americans can get them. Maybe someone can help me out in the comments section. 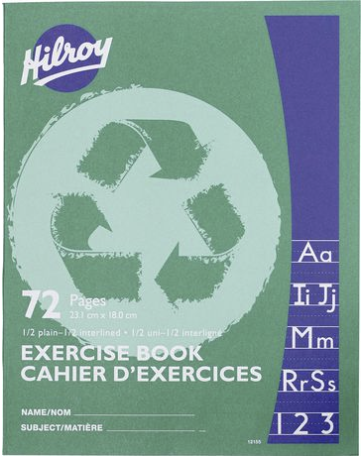 You can buy these exercise books in Canada almost anywhere. (Walmart or Staples for example). The blank space allows them to copy down the problems which are often given in the form of a graphic. The ruled space provides space for their calculations and written explanation. Some students also use the blank space for solution. The two spaces facilitate many conceptualizations. The book is smaller than normal. This sets it aside as important to students and also provides a manageable response section. This way, the exercise book becomes more valuable than their textbook. I like the feeling it creates when their own thinking is valued above everything else. I’m expecting to expand this practice to other classes once a) I can establish a set of good problems and b) become better at facilitating them. The point is to take a common practice, steep it in educational theory, and produce a dual edged sword of efficiency and complexity. As always, I’m open to failure. It is the best way for me to learn. Davis, B., & Simmt, E. (2003) Understanding learning systems: Mathematics education and complexity science. Journal for Research in Mathematics Education, 34(2), 137-167.